I didn't take any pictures, because first I didn't bring my camera along with me on this day (because I didn't think you could take pictures inside the Vatican Museums--while you can't in the Sistine Chapel, you can in the rest of the complex). However there are plenty of images online, so I'll make use of them--including this one of the Prophet Jonah (of Whale and Nineveh fame) who is hangs over the front panel of The Last Judgment of Micheangelo in the Sistine Chapel. More on that later. We walked past the long, long lines waiting to get into the Vatican museums (past the gate that recently opened into Vatican City that bears the present Pope's name over it. Every work done in the Vatican always has the pope who was reigning at the time's name attached to it--P. JPII is everywhere--a lot of work was done in his twenty six years! Unlike the poor souls waiting, we didn't have to, thanks to the generousity of Elizabeth Lev who had told Amy the night before that she could give us a tour of the Sistine Chapel (and also wanted to interview Amy for Zenit--for that interview click here). Once we were inside what I remember first was the Gallery of Tapestries (although this wasn't the first thing we saw, but I believe it was the first time we stopped on our way to the Sistine Chapel). Here was a hallway lined with floor to ceiling tapestries. I believe it was here that we encountered the tapestry of the resurrection where the stone felled by the emergence of Jesus from the tomb followed you in whatever direction you were at the time. Next through the Gallery of Maps (which were mainly large maps of regions of Italy). Next I think anyways(kind of like when you are being driven somewhere and you don't remember the exact route--so too when you are being led by someone who knows where they are going)after going down a flight of stairs we found ourselves in the Sistine Chapel pretty much alone. Wow! I'm sure the Sistine Chapel evokes a number of memories for many people. For people older than me, my guess is that they immediately think of Rex Harrison as Pope Julian barking orders up at Charleton Heston as Michangelo in The Agony and the Ectasy. This wasn't my thought...my thoughts were less than a year old when the television cameras for the first time positioned within the Sistine Chapel showed the cardinals walking in procession to the chanting of the Veni Creator Spiritus entered the conclave that would elect Pope Benedict XVI--I thought if these walls could speak! Of course the walls do speak, the thousands of words that art tells us. Elisabeth told us that Italian artists always positioned paintings in such a way that what was on one wall was speaking to the other. I found myself intrigued by one of the paintings on the wall done by Botticelli The Punishment of Korah, Dathan and Abiram. Why this image? Now, what is the image that this painting depicting the rebellion of Korah speak to? Christ's Charge to St. Peter by Perugino. Amazing how the papacy has survived through countless forms of governments ruling the nations of the earth--and one might counter how those who have broken away have often been swallowed up not so much by the earth but by the culture they exist in to the point that the Gospel of Jesus Christ is lost in the process. It is an ever present tempation for the people of God to think that they don't need the structure that God has put in place. This was one thought, again obviously affected by the thought of how this Chapel is used when it isn't a museum piece. Of the Ceiling images, Michelangelo's interpretation of the "Creation of the Heavens and Earth" surprised me and in trying to search for the image online I can see why. I can't find the other half of the image--the one that shows God's rearend (as if God were mooning the crowd below). This was a surprise. 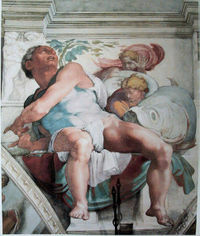 The second was how Michelangelo uses the prophets and has Jonah (pictured at the head of this post) as the prophet that comes closest to Christ and suspends right over the image of Jesus in the Final Judgment. This is another 3-D image where Jonah's feet literally seem to be hanging over the edge. The whole panarama of revelation from sin to restoration, from first creation to new creation. One could present the entire teaching of the Catholic Church by viewing the images on these walls and ceiling. While we were viewing and listening to Elizabeth explain various elements of the art we were experiencing several Vatican workers were shuffling in Chalices and other Mass vessels that she explained were for the Pope's private chapel-they get a very good polishing job. We left the Chapel and headed back to the beginning of the Vatican Museums where we retired to the Museum cafeteria where Elizabeth conducted her interview with Amy and I chased the baby around until I tired and then Katie chased him around. After the interview we made our way back to the beginning minus Elizabeth. We first went to the Pinacoteca gallery then to the Pio-Christian museum (I think Joseph and I were the only one's to venture to the end and witness the ancient image of Christ as the Good Shepherd). Then we made our way with the mass of humanity through the Sobieski Room, Raphael's Stanze, Sala dei Chiaroscuri, Raphael's Logge the Borgia Apartment and then back into the Sistine Chapel which was packed with people. We worked our way through the crowd and exited the door toward St. Peter's which put us on the staircase leading away from the Apostolic Palace and out along St. Peter's Basilica where there was a very good gift shop with some items that I hadn't seen anywhere else in Rome. We made several purchases here before heading down the side steps of St. Peter's and through a different exit that was opened for that day. This took us right over the spot on St. Peter's Square where there is a red pophry rock marking the spot where Pope John Paul II was shot. Jeff Kirby had told us about it, but we hadn't been able to find it on any of the previous days, now we were stooped on the ground looking at it (the original stone had drops of blood and was removed, while this stone was put in its place as a marker). When we arose, there was Greg Burke and the Fox News crew getting ready to film a spot about the Italian Parliament's proclamation blaming the Soviet Union for the attach on the late Pontiff's life. "How did you know about that?" Greg asked us. "Thanks to Jeff Kirby." Amy exchanged plesantries with Mario the Fox producer and also the producer of Rome Reports whom she had been working with through the week. We then set out for lunch. Go here for a compilation of all of Michael Dubruiel's Rome posts.